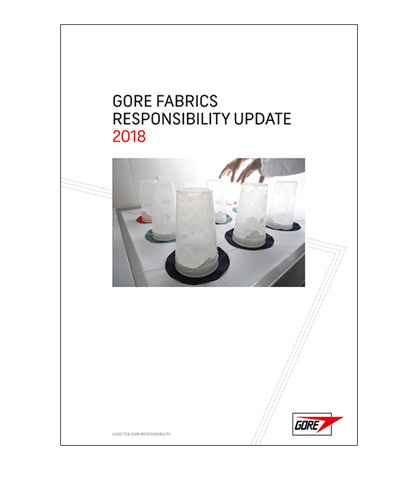 W. L. Gore & Associates´ (Gore) Fabrics Division published its Responsibility Update 2018. The update details how Gore Fabrics is using scientific research to drive environmentally improved material innovations that deliver uncompromised performance with a reduced environmental footprint of Gore Fabrics’ products. The Responsibility Update 2018 is available at www.gore-tex.com/responsibility. One of its key achievements in 2018 is the significant progress Gore Fabrics made towards the elimination of PFCs of Environmental Concern (PFCEC). In 2017 Gore Fabrics announced the ambitious goal to eliminate PFCEC from the entire lifecycle of consumer products by the end of 2023. In early 2018, the Fabrics Division reached the first key milestone of this roadmap by introducing the first GORE-TEX laminates with a new durable water repellency (DWR) that is free of PFCEC. Gore Fabrics also reports on the increased use of recycled and solution-dyed materials in GORE-TEX products and a new Life Cycle Costing methodology for its Technical Oriented Fabrics. In 2018, Gore Fabrics became a member of the initiative “Make Fashion Circular”, joining forces with several global brands in a commitment to develop new pathways for the textile industry informed by the principles of a circular economy. Extending the useful life of a product remains the most effective way to reduce its environmental footprint, as shown in Gore Fabrics´ LCA studies. The durability of a functional product´s performance is a key enabler as well as proper care. In order to help consumers prolong the useful life of GORE-TEX gear, in 2018 Gore Fabrics launched a “Wash & Care” pilot project, and supported Patagonia’s ‘Worn Wear Tour’ to make GORE-TEX products last longer through technical repair. Furthermore, the 2018 report contains an update about Gore’s Guidelines for Social Responsibility (GSR) program. Three years ago, Gore rolled out a multi-step, multi-year program to ensure alignment with its licensees on social responsibility goals. The aim being to join forces with Gore customers and suppliers to improve the lives of workers that make finished products from our Fabrics products. The Responsibility Update 2018 also highlights volunteering efforts Gore Associates have initiated with support of the company. This includes raising 10.000 Euros through the “Bike-To-Work” initiative and support of the Mountain Forest Project in the Bavarian Alps. Finally, the report features two athletes of the GORE-TEX team, Greg Hill and Stefan Glowacz, who went on different expeditions, but shared the same goal: reducing their environmental impact while exploring nature and climbing mountains.